The Bug Out Bag (BOB) is an tool intended to be used in situations that requires evacuation from an area. The BOB can be designed in many sizes and forms but are normally quite heavy and stored in the home. 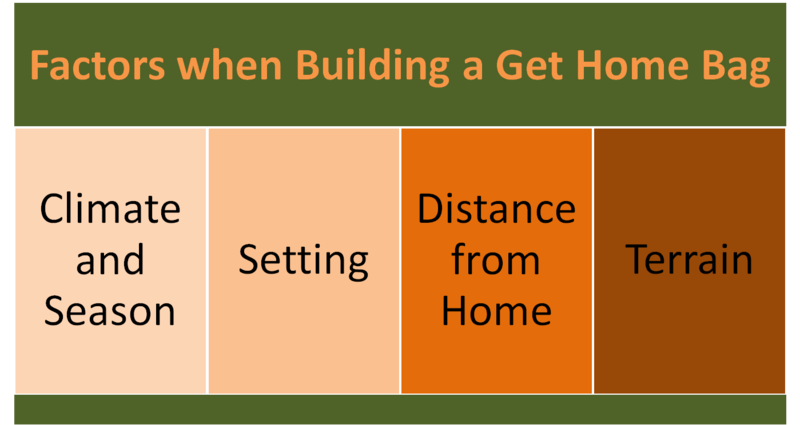 The Get Home Bag (GHB) as a tool intended to provide equipment to allow an individual to reach the home during a crisis or survival situation, for example if the person is at work when a disaster strikes. The Bag should not only serve as a tool for coping with disaster but also function as your every day resource for dealing with problems. 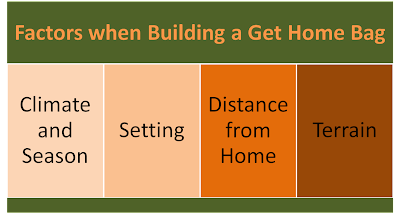 What content your Get Home Bag should have depends on where you live, how long you may have to travel to get back home and your specific situation. The GHB is only a small part of being ready for a disaster. 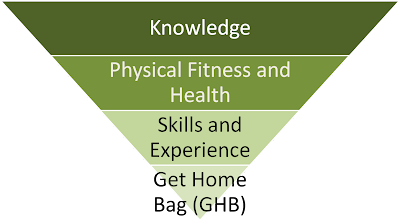 For anyone how is serious about getting ready for a crisis I would recommend that you start out with your health and physical fitness. Go to a doctor and make a checkup. Also visit a dentist and fix any problems you may have with your teeth, in a survival situation a bad tooth can cause infection and a serious health hazard and great discomfort. Your Physical Fitness is very important if you have to make a long walk or march by foot. Start exercising three times a week with an activity that you find interesting and stimulating. The items in your bag is only tools, they are only valuable if you know how to use them. A Fire Steel is of little use if you can’t start a fire with it. Training this kind of skills is critical if you want to be able to use them in a real life situation. The same goes for all Skills, no matter if it is Self Defense, Starting a Fire, First Aid or Navigation. Your clothing provides your shield against the elements. Your clothing must be appropriate for your particular climate. Shell jackets provide excellent protection from wind and rain; also get a pair of gloves and hat or watch cap. Merino wool is an excellent material for t-shirts and a sock that does not cool the body when it wets like cotton do. Your shoes are perhaps the most import part in any situation when you have to walk a longer distance. Make sure that they are comfortable and if possible also waterproof. A watch is also something that you should try to carry at all times. Your cell phone can be vital tool for communication in many emergencies, make sure that you have In Case of Emergency (ICE) numbers programmed if something would happen to you. A water proof container for the phone can help keeping it safe from the elements. Some phone may also have useful application like a flashlight, compass, FM/AM radio and GPS. If you have a phone that has a short battery life a spare battery can be essential. What kind of bag you should get depends on your Every Day Activites. Ideally you should be able to carry both the items that you need for your everyday activities like a computer, notes, books, lunch box and other essentials in addition to the items you carry for crisis preparedness. Another option is to have a separate bag for emergencies in your vehicle or at your office. The size of the bag depends on how much space you need and what kind of bag that you prefer. Back packs are generally the most comfortable solution especially if you have a heavy pack. Shoulder bags can be a good alternative but are not as comfortable to carry if they are heavy since al the weight of the bag will be on one shoulder. There are also bags that are a mix between backpacks and shoulders bags called gear slingers. Maxpedition make some interesting bags in this category like the Monsoon, Sitka and Kodiak. There are a number of different companies that makes excellent bags like Kifaru, Snugpack, 5.11, Fjällräven, Osprey, JanSport, Lundhags, Klättermusen, Haglöfs, Exped, The North Face, Norröna, Bergans, GoLite and Arcteryx. Find a bag that fits your needs and that is comfortable to carry. [ ] A Get Home Bag should have some kind of shelter than can help shield you from the elements, this can for example be a Light Weight Poncho, Bivanorak, Fjellduk, Exped Bivi-Poncho, Emergency Blanket or Light Weight Tarp. [ ] Water is something that can be critical in a survival situation and your bag should have at least one small water bottle, the bottles from Nalgene, Camelback, Klean Kanteen and SIGG has a high quality, but a normal soda bottle can be used as well. This can also help you save money instead of buying soft drinks while on the move. If you have to purify unsafe water after a disaster it can be good to include some water purification tablets or a compact water filter. [ ] Some kind of item that can help you start a Fire like a Fire Steel, Lighter, Matches in a Waterproof container and tinder. [ ] A Survival Knife is a useful tool but you must check what the specific legal aspect of this is for your country – what kind of knives are legal and where is it allowed to carry them? There are also credit card sized tool kits from Victorinox and Tool Logic that you can carry in your wallet at all times. [ ] A Compact Flashlight or Headlamp can provide light in dark conditions and be used for signaling. Choose a compact light that doesn’t take up to much space in your bag. Compact flashlights thats using a single AA or AAA battery can be found from Fenix and 4Sevens, the anglelights from ZebraLight can also be an interesting alternative. [ ] Notebook and Pen, excellent for writing down important information or for leaving a note. I personally like the notebooks from Rite in the Rain. [ ] Compact AM/FM/Shortwave radio with Dynamo or A Compact Radio Scanner. [ ] Paper Tissues can be used as Tinder or as Emergency Toilet Paper. [ ] A compact First Aid Kit with some basic band aids and disinfection wipes can be a good thing for treating small cuts and treating wounds. The first aid kit is important but the most important part is that you take a course so that you know CPR and the basic skills. Also include some painkillers and anti-diarrheal tablets. If it is flu-season a small tube with alcohol based disinfection may also be a useful addition. Most people carry at least some items on their person that can be useful during an emergency or survival situation. These items are often refered to as a persons Every Day Carry (EDC). Many Survivalist and Preppers may carry items like Pocket Knives, Flashlights, Lighters or even a Pocket Survival Kit. Your GHB should be built with this factor in consideration. If you carry lighter on your person it can be a good idea to consider another tool to create a fire like a Fire Steel or Matches for your GHB. If you have a Flashlight that use a particular type of batteries as EDC and want a Headlamp for your GHB it can be a good idea to choose a model that use the same type of batteries as the Flashlight or if you carry a Swiss Army Knife for EDC it can be a good idea to consider a Fixed Blade Knife or Multi-Tool for your GHB. 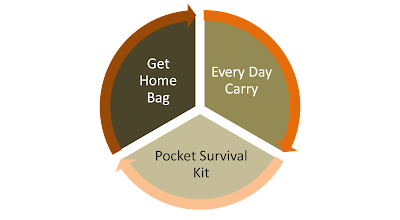 A Get Home Bag is a concept that lands somewhere between your Every Day Carry and a Light Weight Bug Out Bag. There is no clear line between the different concepts, the important thing is that you create a concept that fits your personal needs and provides the tools that you need. Disasters can strike without any warning and even if your Get Home Bag is not designed to provide the function for an evacuation you may have to make do with this bag or your Every Day Carry in a worst case scenario. Equipment is an import part of preparedness, but items can be lost or incomplete. 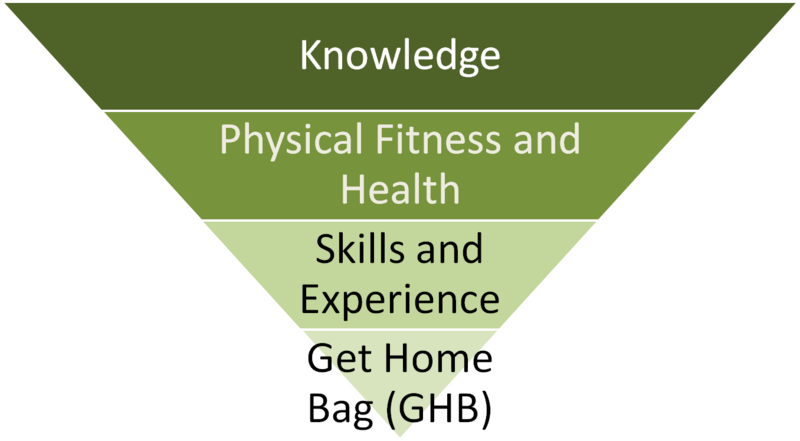 The main focus of your efforts should always be too improve your health and physical fitness, learn relevant skills and your improving your knowledge since these are the things that is always with you, no matter the situation. Very helpful and overlooked aspect to any emergency situation! Under most emergency situations, one needs to GO HOME and few preppers have considered this type of bag. Thank you for this valuable information! Am I missing it, or is there no food on this list? I would definitely pack some granola bars, trail mix, etc. I appreciate the information contained here, but do want to add a small piece of criticism. Whoever is doing the typing or editing needs to run a spelling and grammar check. There are errors on almost every page and they detract from the site.